If you are receiving Missing Out Notifications for an employee, but the employee claims they are indeed clocking out at the end of their day, there are a couple possible causes. The good news is that generally this is an easily solved problem. 1. Make sure the Employee is clocking out, then leaving the ClockShark app running on their device. Sometimes we find that employees immediately forcefully kill the ClockShark app after clocking out. If an employee kills the ClockShark app before it has a chance to sync with the ClockShark web service, then the time activity may be lost or delayed. There is no need for employees to kill the app when they clock out. The app will remain in the background of their device, and will no longer track their time or location until they clock back in for work. 2. Make sure the Employee is leaving mobile data turned on. Sometimes we find that Employees are disabling mobile data on their device to save data or avoid going over a data plan limit. 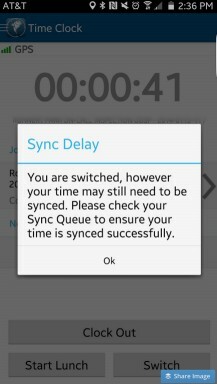 Since ClockShark relies on mobile data to function properly, turning it off will likely cause delays with time activities being synced (since the app is waiting for a Wifi connection to send any queued events). It's important to know that if you have received a Missing Out Notification, it may simply be because the ClockShark website is not aware yet that the employee clocked out, since the clock event has not successfully synced. In that case, as soon as the mobile device is powered back on, or the ClockShark app restarted, or the data connection restored, the missing clock events will be sent to the ClockShark website, clearing the Missing Out Notification and replacing it with the correct out time.